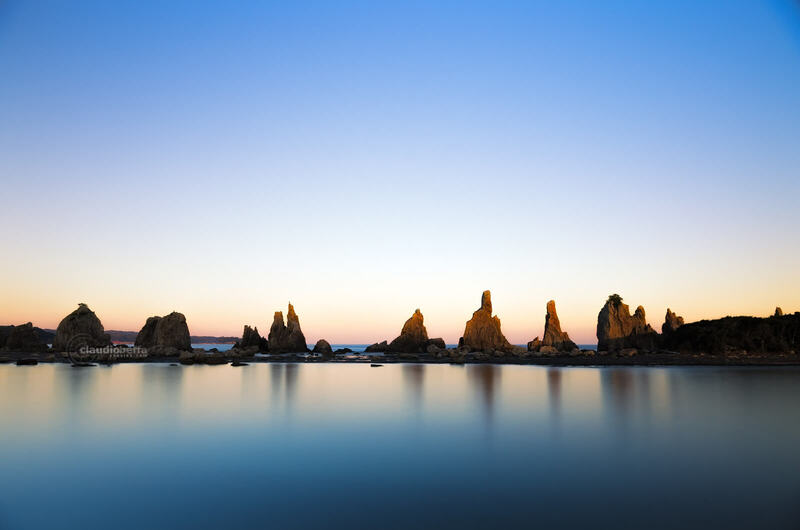 In the southernmost area of Wakayama prefecture, about 130 Km far from Osaka as the crow flies, there’s a place whose appearance is shaped by the strong winds and the fierce waves of the Pacific Ocean: Kushimoto, in the Higashimuro district. The strip of land connected to the rest of Higashimuro district through a thin isthmus forms a bay that faces South-East, in the middle of which rises Kii Oshima island. In the northern end of this bay there’s a natural formation unique in its shape as well as in its allocation: it’s a group of about 40 rocks which stretches in line for 850 meters in the sea, in the direction of Kii Oshima. 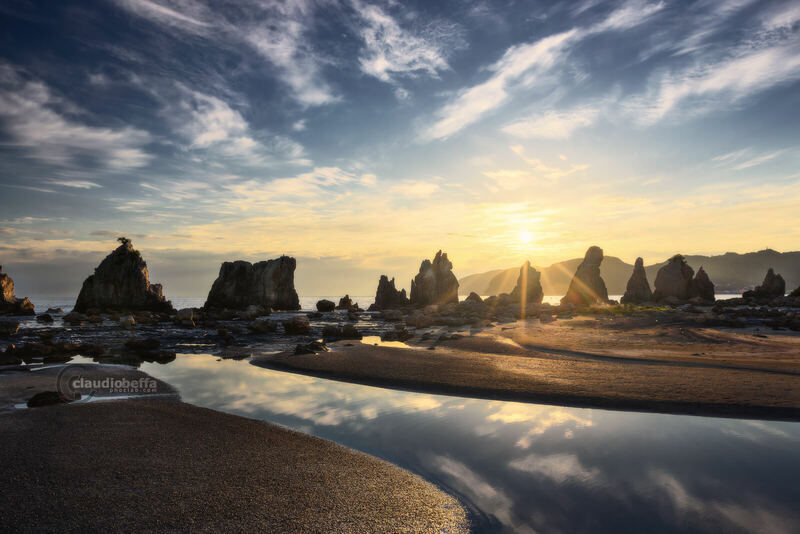 The singularity of these rocks, whose name is Hashigui Iwa, earned them the title of National Natural Treasure. For those who know a little bit of japanese language, the name itself will sound quite distinctive: Hashigui Iwa, in fact, means “bridge’s pillar islands”. The meaning of the name Hashigui Iwa probably originates from a legend, according to which the great monk Kobo Daishi would have tried to build a bridge between Kushimoto and Kii Oshima, having agreed to the request of the people of Kushimoto. A demon named Amanojaku, who prevented any attempt to build the bridge until that moment, challenged Kobo Daishi to succeed that task alone in just 24 hours, giving him a superhuman strenght; the expiration of the given time would have been the call of a bird. The monk undertook bravely the great challenge, throwing in the sea, one after the other, many rocks to use as pillars of the bridge. The demon, witnessing the valor and the alacrity of Kobo Daishi and fearing the defeat, decided to deceive him simulating the call of the bird; thus Kobo Daishi ingenuously halted his task, losing the challenge and leaving the work unfinished. The rocks that we can see today, according to this legend, would represent the vain effort of the great monk. During my one-month adventure in Japan, I dedicated two days to shoot some seascapes of Wakayama, so the coast of Kushimoto has been chosen because of its peculiarity and because I was curious to find out how I would have felt standing on the extreme southern end of Honshu. Well, from that spot, if you look south-east you can virtually trace a line which crosses the Pacific Ocean for no less than 17’000 Km, without seeing a single grain of land up to Chile! I would define it a sense of openness, to say the least. After about three hours by car from Osaka, I arrived to Kushimoto in the afternoon and I found myself before the Hashigui Iwa just in time to capture their amazing beauty during twilight. 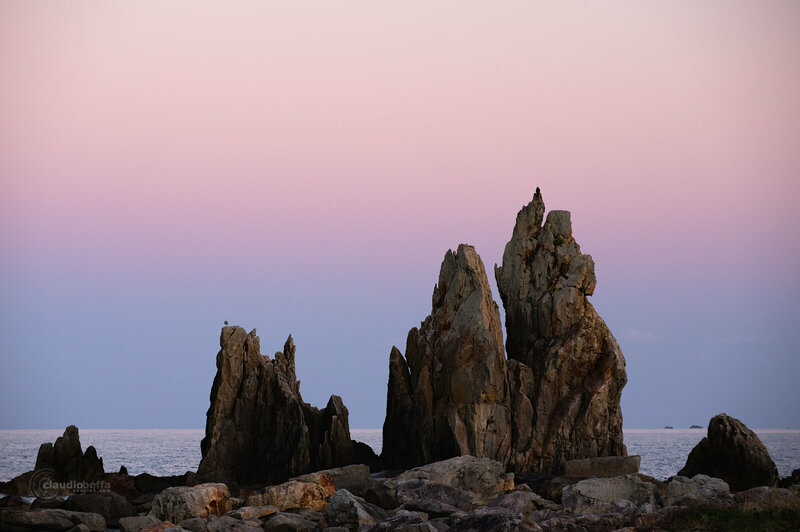 The rough shape of the rocks in contrast with the soft gradient of colors of the sky made up a dreamy view, in which I floated in contemplation for an indefinite amount of time. So I composed two photographs: for the first one I used a wide angle lens to create a view which could have reflected what I was seeing and feeling in that very moment. For the second one I chose a tele lens to get close to the rocks, emphasizing their sharp geometries and the textures of the stone. A detail of the Hashigui Iwa during twilight. Kushimoto, Japan. As it was getting dark, the best thing to do was definitely going to enjoy a dinner: in the vicinity of the Hashigui Iwa site I found a small traditional restaurant, run by a couple of friendly and kind elderly. While I was savoring the delicious local food, I exchanged a few words with the couple, who told me that, despite the beauty of southern Wakayama, they don’t see western faces so often; partly because it’s a bit far from the biggest cities (and somewhat inconveniently connected) and because tourists are mainly interested in visiting the most famous attractions. I could have not been happier, since I like to discover the less visited places and I love to enjoy the authentic japanese lifestyle and hospitality, that’s easier to find in the countryside than in the modern megalopolises. They also told me that the area of Kushimoto is the first one to be run over by the strong winds and the rains of the summer typhoons, which then proceed their route up to Osaka and the Kinki area (I’ve experienced a couple of times the fury of these typhoons in Osaka and it’s definitely an event to observe sheltered somewhere in safe…). It’s fascinating to see that the Hashigui Iwa and the entire Kushimoto coast are shaped by the other natural elements, reflecting so the spirit of this land. The following morning the alarm clock rung quite before the sunrise; I prepared my gear in two minutes, hurrying then out of the room. The dazzling beauty of the sun rising among the Hashigui Iwa filled my eyes and my heart, impressing in my mind a feeling of peace and joy; I’ll never forget that magical moment of a cold morning of autumn. The image shown here represents just a fraction of the beauty of that moment, nevertheless I’ve put all of myself in trying to catch a glimpse of that magic. It’s the result of the manual blending of five exposures (to capture the entire high dynamic range), using the luminosity masking technique to represent the scene as real as possible; I hope you like it. I warmly recommend you to take some time to visit the southern area of Wakayama (maybe not during summer…), if you are planning to visit Japan, because there you will find a marvellous nature in its wild form. Know that, not far away from Kushimoto, there’s the enchanting Kumano Kodo, one of the most important spiritual places in Japan, a series of sacred pilgrimage routes which cross the immense forests and the mountainous territories of the Kii Peninsula. I will tell you of Kumano Kodo in a future article, since I have a lot of photos of it to prepare; for the moment I hope to have given you an inspiration to discover a new and amazing part of Japan and to see with your eyes the magnificent beauty of the Hashigui Iwa that waits for you. The third image of this article, called “Rising up to the light”, has been awarded with an Honorable Mention at the ND Awards 2015 , in the category “Nature / Seascape Waterscape.